This probably belongs in the “MQA is dissapointing” thread. Who runs this forum? Robespierre? Given the way things seemed on a steep slope to re-litigating established stuff around MQA (that it’s lossy, that 2nd unfold is just upsampling, etc), with the same 2 or 3 BS fanbois finding a fresh, unsuspecting audience not necessarily versed in the dark arts of parsing MQA Ltd’s mendacious ways, don’t you think quarantining is the saner option for everyone ? It is indeed a sad story here where people just take literally all the claims and assumed it is actually true. All these are part of marketing to lure people like you. All it takes is a little understanding how MQA works. I can summarize a few sentences for you. 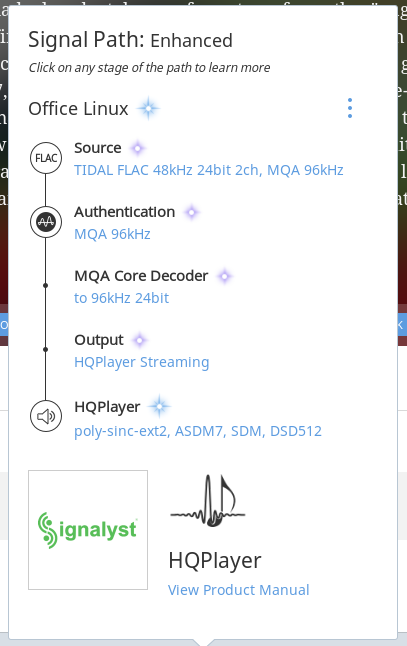 MQA is only good for recording up to 88.2/96k that is because MQA core decoder will unfold all the musical details up to 44.1/48kHz response, and this is done as an approximation (lossy) of the original recording. Subsequent rendering is done with MQA de-blurring filters with over-sampling to match the DAC chip. In all certified MQA DACs, those can display the sample rates are actually showing the ‘authenicated’ sample when playing back MQA. It doesn’t show the actual sample rate done by the internal DAC chip. So don’t be fooled by this. I did answer that Per. [dac] In your Signal Path, where I put the RED DAC, this indicates the stream has left Roon and is at your DAC. [DACdoing] The Signal Path is showing what your DAC doing. It is reporting what it is doing back to Roon. Your DAC is doing processing on the signal and Roon is reporting that as Enhanced because Roon does not know if the DACs processing is bit perfect. I am not sure of your settings on Roon, as you never showed it. I did share my settings since post #30, here it is the link. I do not want any more controversy here, this post is not about MQA. I only wanted to have clear references regarding ROON Signal Path Quality and Meaning. No Sir, the PCM filters are Sabre Chipset (or any other Chipset) features and they do not upsample the signal. 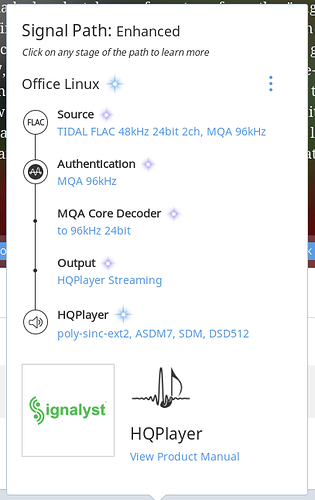 When you play an MQA stream all Chipset filters are totally disabled since that is the way MQA technology is designed. No, with MQA enabled DACs they are replaced with one of 16 MQA upsampling filters which are horribly bad quality ones. MQA carries maximum content at maximum 88.2 or 96 kHz sampling rate. Output at 352.8 kHz is result of upsampling from 88.2 kHz content rate using the poor MQA filters. You get much better result by letting Roon decode the content to 88.2/96k and using good upsampling filters instead. And here is a link where you can confirm this, where you can find samples up to 352.8 KHz on PCM and DSD256 of the very same tracks. I’ve compared the MQA version to the original 352.8k version to verify that indeed the MQA version reduces resolution of the original and doesn’t carry all information of the original. It says LOSSLESS as you can see here. And that “24-bit 192kHz” is bogus, that is the original source resolution, but not something that would be actually carried by MQA. With HQPlayer Roon now always says “Enhanced”, so if you like to use HQPlayer you’ll have Roon telling that the output is enhanced by HQPlayer. In latter case, signal path in Roon is bit-perfect but it still says “Enhanced”. MQA carries maximum content at maximum 88.2 or 96 kHz sampling rate. 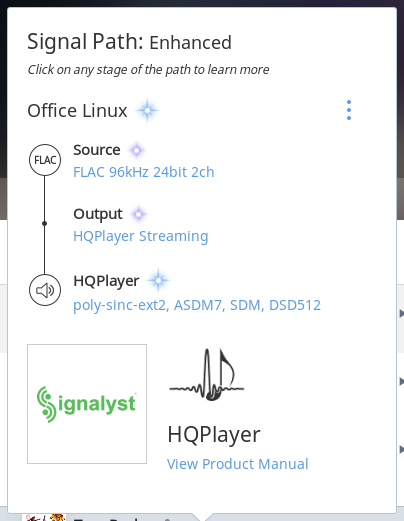 Which is exactly what my streamer (Bluesound Node 2) sends through it’s SPDIF output when I want it to decode MQA files and have the DAC in my receiver handle the end conversion from PCM to current. But nobody is showing any math, nor a real time graph or a single solid evidence of what you are saying. I will truly appreciate that you would show us some support for your statements. See the links and references to Jussi’s 2016 posts here. Also see Archimago’s summary here. The evidence says it all. That isn’t to say that MQA doesn’t sound good. In my system al least, MQA does sound good, and gives lossless, true ‘High-Res’ FLAC files a good run for their money. Indeed, on some recordings I actually prefer the MQA stream over the High-Res FLAC stream. But MQA is technically proven to be a lossy, truncated version of a lossless master. That doesn’t make it ‘bad’. It’s just important to clarify was MQA is, and equally what it isn’t. Which is, ironically, what MQA Ltd. seem to have ‘difficulty’ with, the ‘difficulty’ being that IMO MQA Ltd. don’t want to be honest with consumers. I have read all the text from @jussi_laako and found them more centered over DRM and consumer’s rights than technical support. And in that case I do not have any reason to complain as MQA in the real world does not cost me more than other technologies. For me, as a humble user that only wants to hear the music the best way possible, MQA sounds better than any other option. Specially given the fact that it allows me to have millions of titles available from TIDAL MASTER. And for 10 bucks a month. That is a lot of Musical Culture for a truly low fee. And it’s the most rewarding experience in my life as Music Lover. If you don’t like MQA that’s fine. I just wanted to let you know that your arguments just confirm to me that there’s nothing that would make me have the slightest doubt that all the great sound I’ve been hearing in MQA is fake. And I really appreciate your help on this research. As long as you’re enjoying the music, that’s the main thing, irrespective of where it is sourced from. MQA is not some miracle format which is what you are trying to make it out to be and is why you are getting so much push back. Well, that and the “I’ll come in here and ask questions like I am trying to learn and then tell everyone that they don’t know what they are talking about” attitude. 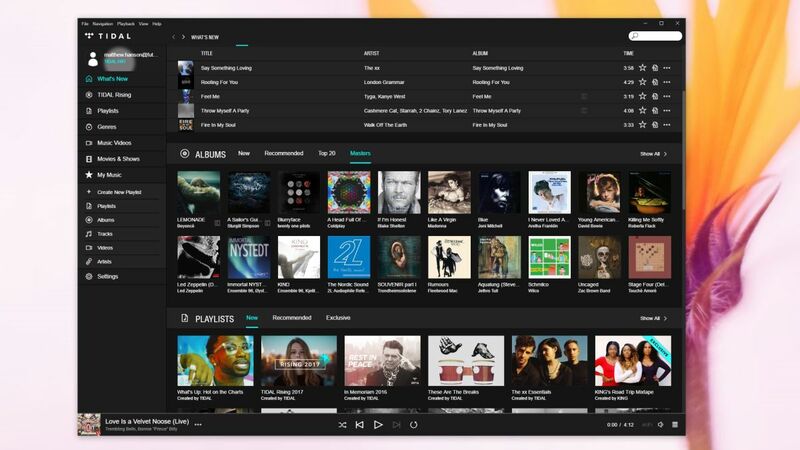 In the Latinoamerican Region we have TIDAL MASTER for $9.99 a month. Like I said, if you do not like TIDAL or do not think MQA is a great thing, is perfectly fine for me. I am just explaining what I do like and why. And this is not necessarily the best solution for everybody. I really appreciate all your comments regarding the subject of this thread. And I would like to ask you, according the rules of this community to stay commenting on this subject only. This is not an MQA, nor TIDAL thread. I don’t want to appear as uncourteous not answering any comment out of it. MQA DACs that display any sample rates that are based on the ‘authenicated’ sample info in the form of a flag; if the recording source is mastered in 352.8k like in 2L case, MQA will flag this as 352.8k. All DACs will always display the actual file sample rate but MQA unfolding and rendering does not reflect this; unfortunately. In my opinion, the ‘authenticated’ sample rate display on all MQA DACs to me is like ‘fake’ it does not reflect the actual file sample rate. We all know MQA core will always output at 88.2/96k no matter what. The renderer which is tied to a know DAC chip will over-sampled with MQA filter to the maximum capability of the chip. Most off-selves DAC chips will max out 352.8/384k. The newer ones can go up to 705.6/768k.